The Cut Glass Dish quilt block has been around for a long time. There are many variations as well, simply by adjusting the colour placement. The block is constructed of simple patches -- only the square and half square triangle units. The only difficulty lies in being precise in your seam allowances during construction, due to the number of cut pieces. The sample quilt layouts illustrate the different looks you can achieve by rotating several of the quilt blocks, whether in a straight set or a quilt set on point. 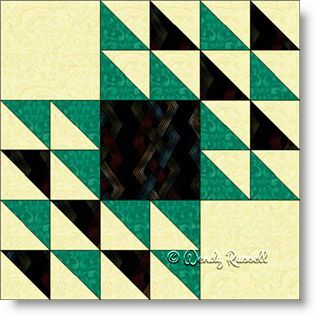 There is no end to the variety of quilts you can create with this one block.